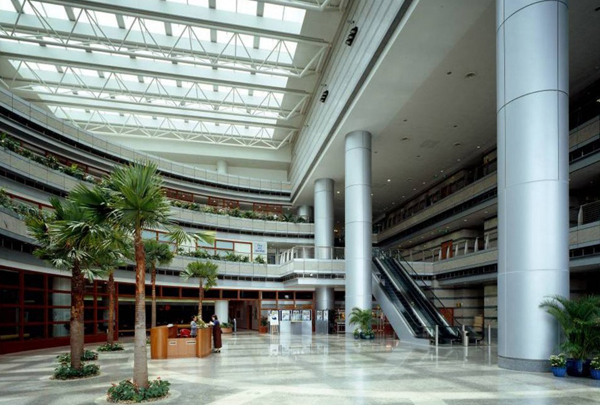 JTC Summit is a commercial building situated at 8, Jurong Town Hall Road, Singapore 609434 in District 22. It is mainly for Office rental and sale. This 32 storey development maybe an ideal place for technology related and engineering firms. In-house amenities available include 300-pax auditorium, penthouse, fitness club and recreation lounge as well as 24-hour security to cater for all your needs to create a balance work-life. JTC summit is completed in year 2000 and the JTC headquarters is located right here. Other key tenants include EDG Asia Pacificm Mindchamps Preschool, ExxonMobil and Panasonic Trading Pte Ltd.
JTC Summit is located at 8, Jurong Town Hall Road, Singapore 609434 in District 22. The nearest Mrt station is Jurong East MRT Station which is approximately 0.35 KM away. Other nearby Mrt stations includes Pioneer and Lakeside stations. Driving to Singapore’s Central Business District/ Marina Bay district will take you under 25 minutes. There are also many nearby bus stops like the ones at Jurong East Library, at Jurong Town Hall and opposite Jurong Town Hall. Major expressways like PIE and AYE allows you to get to many places conveniently. It is located in the Jurong Town part of Singapore and is seamlessly connected to the rest of the country. Supermarkets: The nearest supermarkets is Sheng Siong supermarket at 61 Teban Gardens Road, Cold Storage supermarket at Jcube, Giant supermarket at 2 Jurong East Street 21 and NTUC Fairprice at 134 Jurong East Street 13. Education: The primary educational institutions around include Fuhua Primary School, Juying Primary School, Shuqun Primary School, Jurong West Primary School and Xingnan Primary School. Places of worship: For places of worship in this multi-racial and religion society, one can head to Masjid Almukminin Mosque at 271 Jurong East Street Road, Sri Arulmigu Murugan Temple at 281 Jurong East Street 21, Sattha Puchaniyaram Buddhist Temple at 550 Yung an Rd, Singapore 618617 , Sheng Hong Temple at 300 Pandan Gardens and Jurong English Church at 1 90 Jurong East Street 13. JTC Summitis definitely a highly sought after commercial building as it is located near to Singapore’s upcoming Jurong Business hub and Jurong Lakedistrict. There are a myriad of facilities in-house and nearby to cater for all your needs. For more details, please contact the relevant personnel.